Biryani was introduced in Indian via Mughal cuisine.Vegetable Biryani is an Indian rice dish bursting with flavor, delicious spiced vegetables and rice ..Its not very easy to cook biryani, as firstly it do requires a lot of ingredients ,lot of attention and takes time to cook, but the final result is simply awesome and lip smacking.It is definitely a satisfying meal all by itself. 1) Rub the saffron strands in milk and keep it aside. 2) Wash the rice.Soak Rice for 1 hour.Then Drain it. 3) Bring 5 cups of water to a rolling boil and add Cinnamon Stick, Cloves, Black Cardamom, 1 tsp Oil, Salt, drained soaked rice and a few mint leaves. 4) Cook rice for exactly 5-7 minutes. Immediately drain the water from the rice and add ghee and mix gently making sure not to break the rice grains. Rice should be 3/4 cooked i.e. 70% cooked– not fully cooked. 5) Heat oil in a pan.Fry onion slices in oil till it is golden brown.Remove it and Keep it aside. 6) Then fry 1/4 cup each of halved cashew nuts and keep aside. 7) Add Whole garam masala - i.e. Bay leaf, cinnamon stick,cloves,black cardamom ,saute it then add shahi jeera( Black cumin seeds) , ginger garlic paste , vegetables which are cut in big size.Then add salt .Mix well.Vegetables should be 70% cooked i.e. 3/4 cooked. Now add half mint,half coriander,green chillies,biryani masala ,mix half cup of curd.The vegetables should be nicely coated with masala.Be sure to stir occasionally to prevent sticking/burning. 8) Heat a little oil in a thick bottomed pan(I use the pressure cooker pan). 9) First Arrange a layer of the half vegetable mixture then add some curd then nuts.Then spread a layer of fried onions. 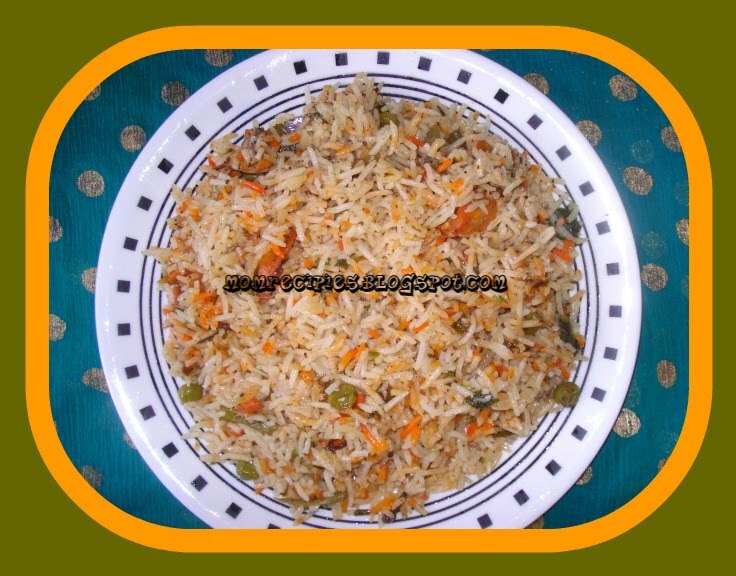 Then spread half the layer of partially cooked rice..Sprinkle 1 tsp of Biryani Masala on the rice. 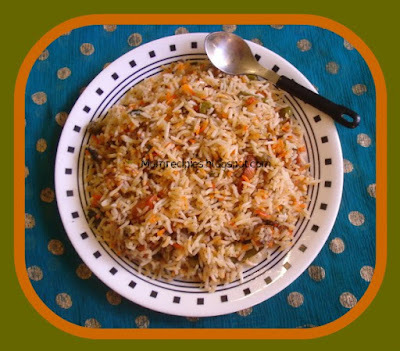 10) Layer remaining vegetable mixture and sprinkle Fried Onions on top.Layer partially cooked rice over the veggies and sprinkle 1 tsp Biryani Masala. 11) On the top of this sprinkle remaining chopped mint and chopped coriander..Garnish with fried onions. 12) Sprinkle little bit of saffron milk mixture.Drizzle with some ghee if desired . 13) Cover with a lid and cook on low flame for around 15 minutes till the rice is cooked OR Cover with tight lid or foil ,bake on a preheated 350 oven for 30-35 min , until steaming hot. 14) Then mix everything properly. Take care that rice grains should not break. Biryani can be served by itself, or with a simple raita or some yogurt on the side. * Cooked rice expands so be sure to use the proper size pan. * Vegetables should be cut in medium size or big size chunks. * Saffron and mint are key ingredients for biryani. * Vegetables can be added and subtracted to your choice. looks really yummy & perfect.. I want to have that whole plate. Super delcious. Hi Sireesha,please accept'Inspiration Award'. Your blog inspires me to try out something new all teh time..thank you for your wonderful blog.